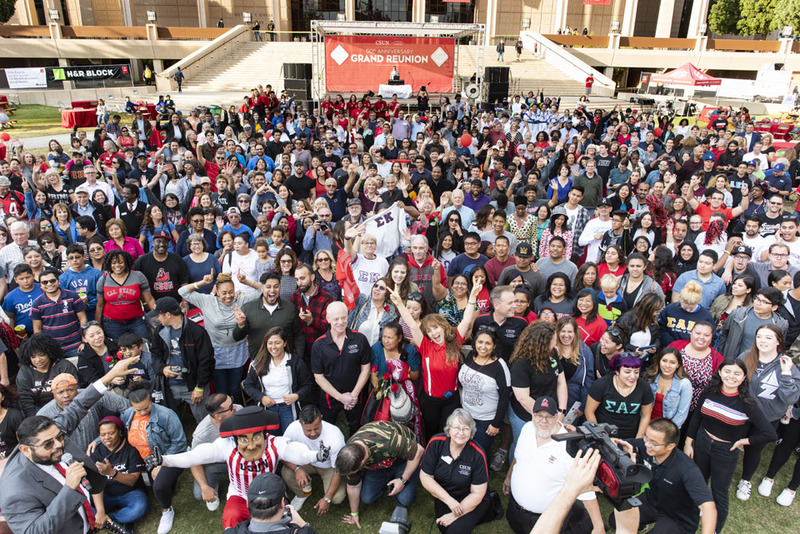 A crowd of thousands of alumni, students, staff, families and members of the community chant, "Once a Matador, Always a Matador!" during a photoshoot in front of the Delmar T. Oviatt Library, on Oct. 13, 2018. 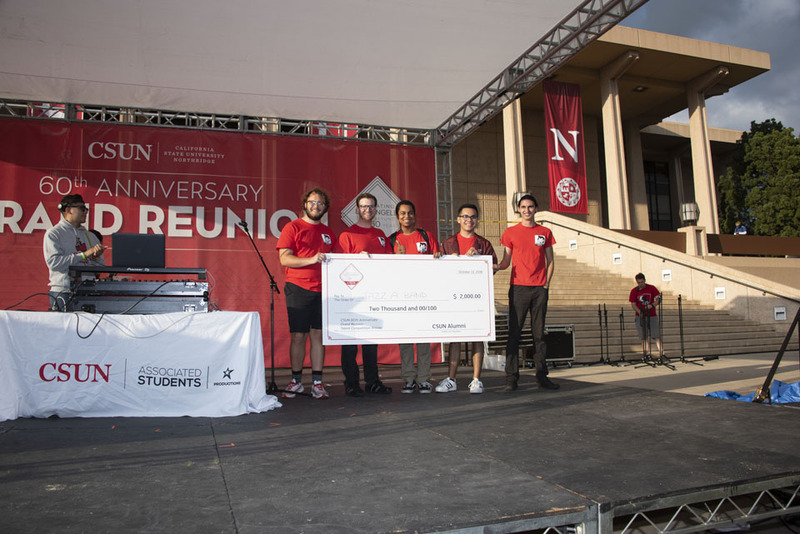 The Grand Reunion event celebrated CSUN's 60th anniversary. Photo by Lee Choo. 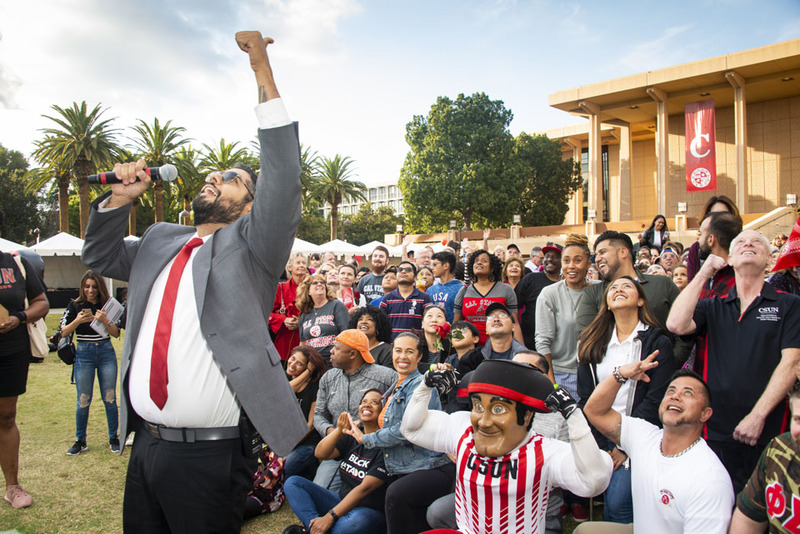 CSUN alumnus and campus Director of Marketing Kevin Lizarraga rallies a crowd of thousands to chant, "Once a Matador, Always a Matador!" 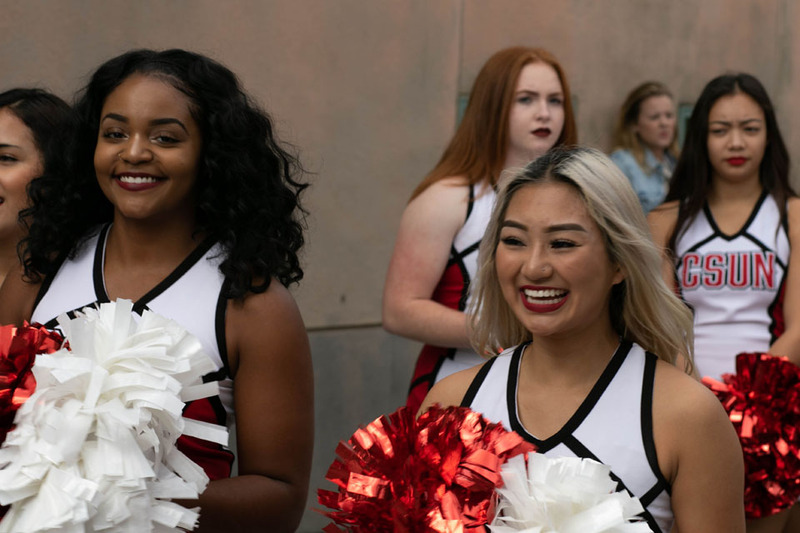 during a large-group photoshoot in front of the Delmar T. Oviatt Library, on Oct. 13, 2018. 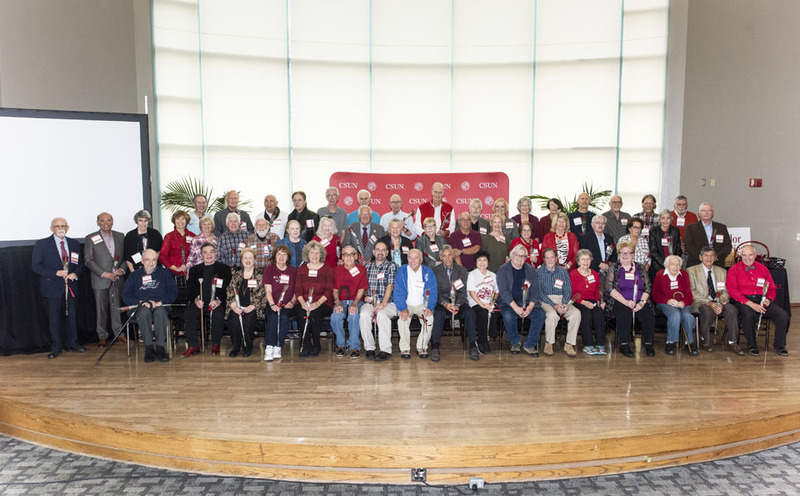 The Grand Reunion event celebrated CSUN's 60th anniversary. Photo by David J. Hawkins. 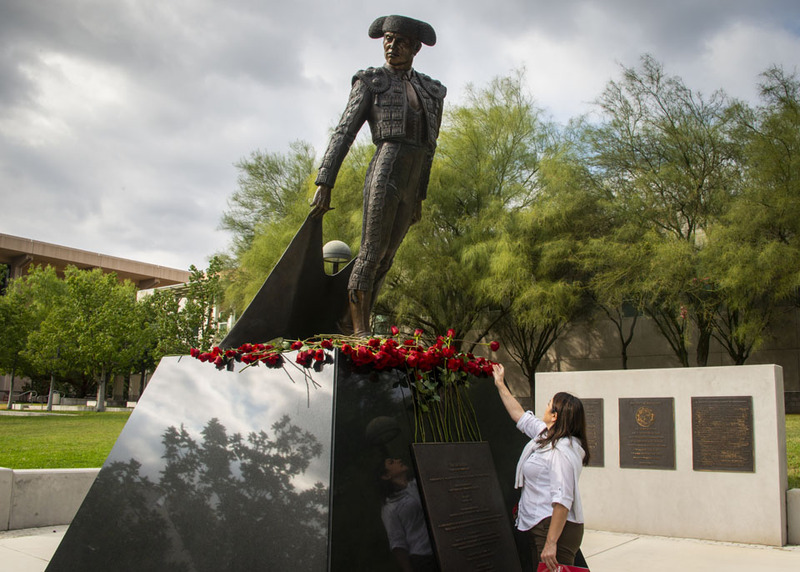 A crowd of alumni, students, staff, families and members of the community chant, "Once a Matador, Always a Matador!" 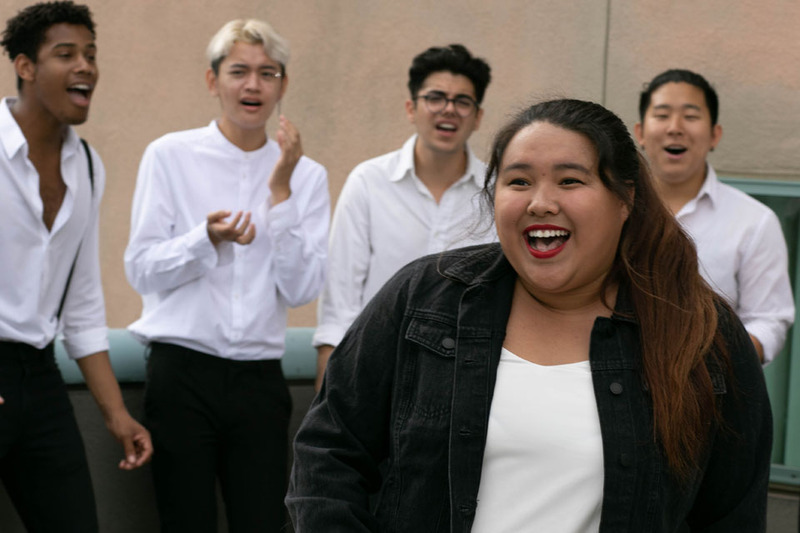 during a photoshoot in front of the Delmar T. Oviatt Library, on Oct. 13, 2018. 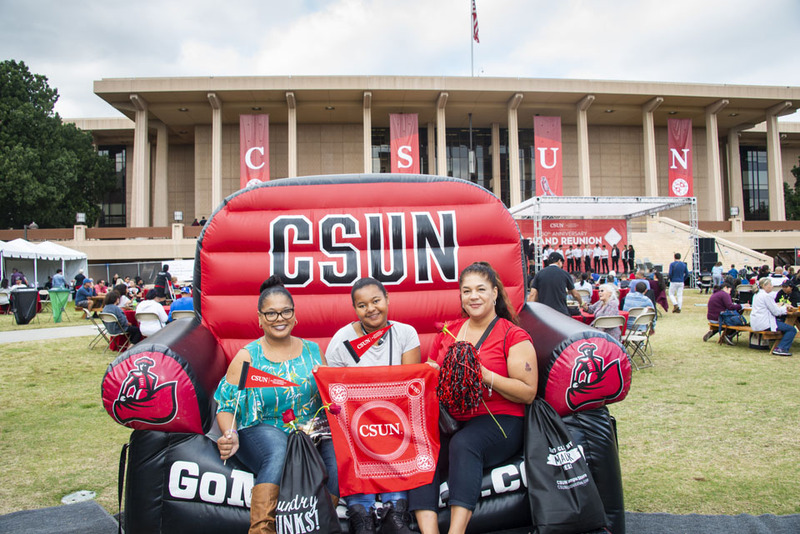 The Grand Reunion event celebrated CSUN's 60th anniversary. Photo by Lee Choo. 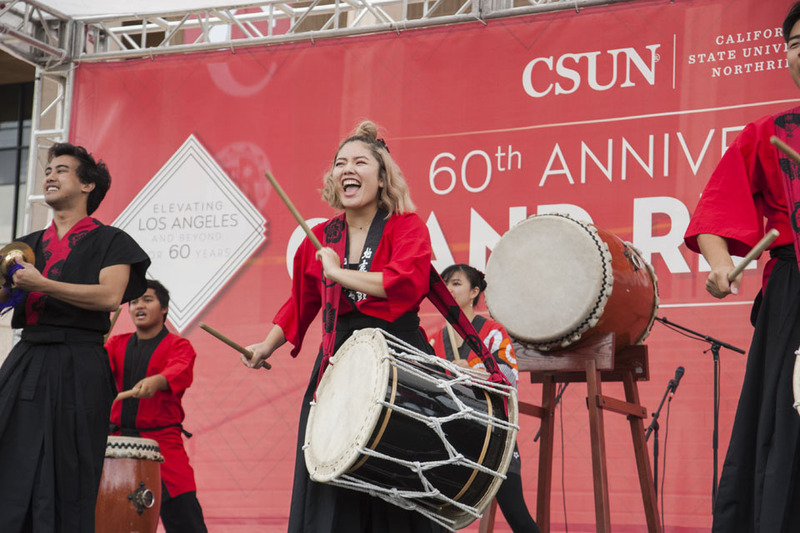 CSUN student members of the campus Taiko drumming troupe perform in the "Matadors Got Talent" competition, at CSUN's 60th anniversary Grand Reunion on Saturday, Oct. 13, 2018. Photo by Patricia Carrillo. 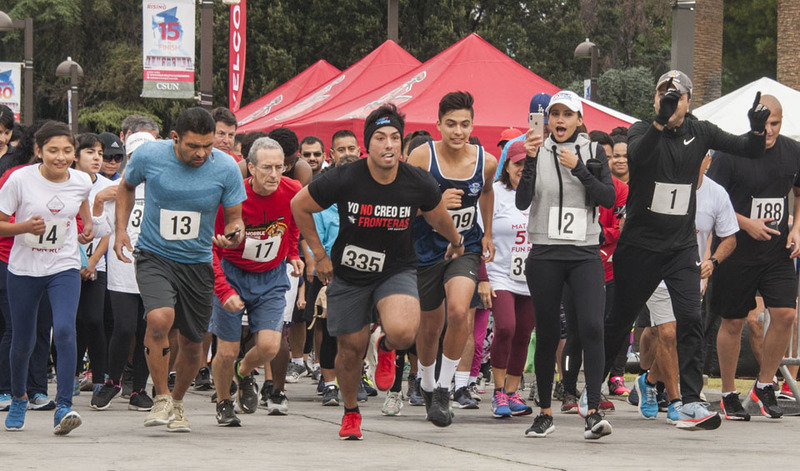 Matador students, alumni, staff, families and members of the community kick off CSUN's 60th anniversary Grand Reunion on Saturday, Oct. 13, 2018, with a "Matador 5K Fun Run." 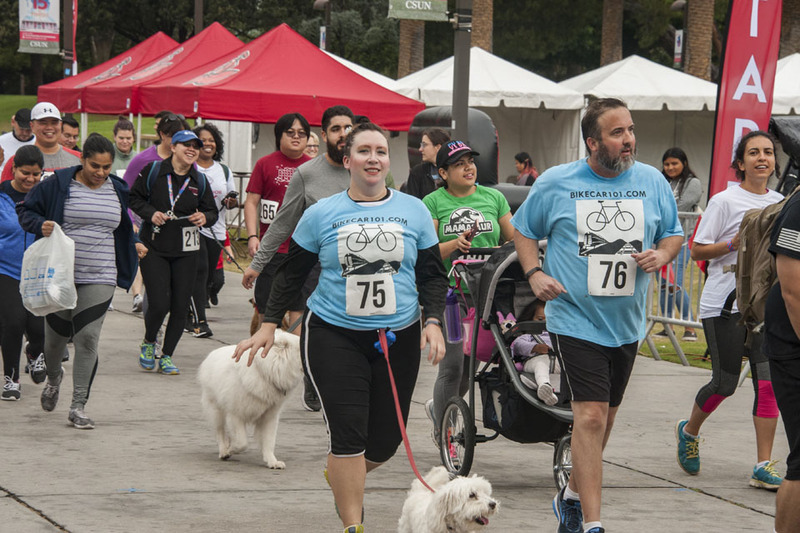 Participants run, walked, strolled and strutted their mutts around the campus perimeter. Photo by Patricia Carrillo. 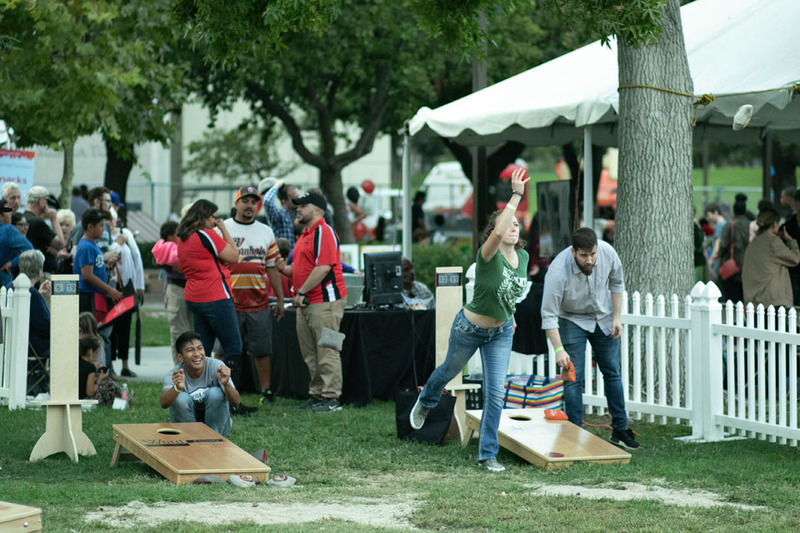 Students and alumni take on the campus zip line, at the CSUN High Ropes Course (adjacent to Matador Field baseball complex), at CSUN's 60th anniversary Grand Reunion on Saturday, Oct. 13, 2018. Photo by David J. Hawkins. 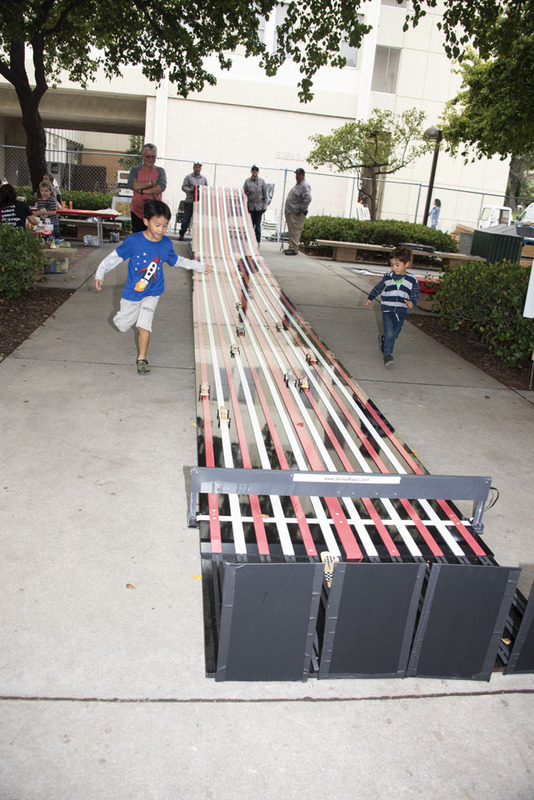 "Junior Matadors" race cars on the Matador Motorway, at the Kids' Zone on Oct. 13, 2018, at the CSUN 60th anniversary Grand Reunion. Photo by Lee Choo. 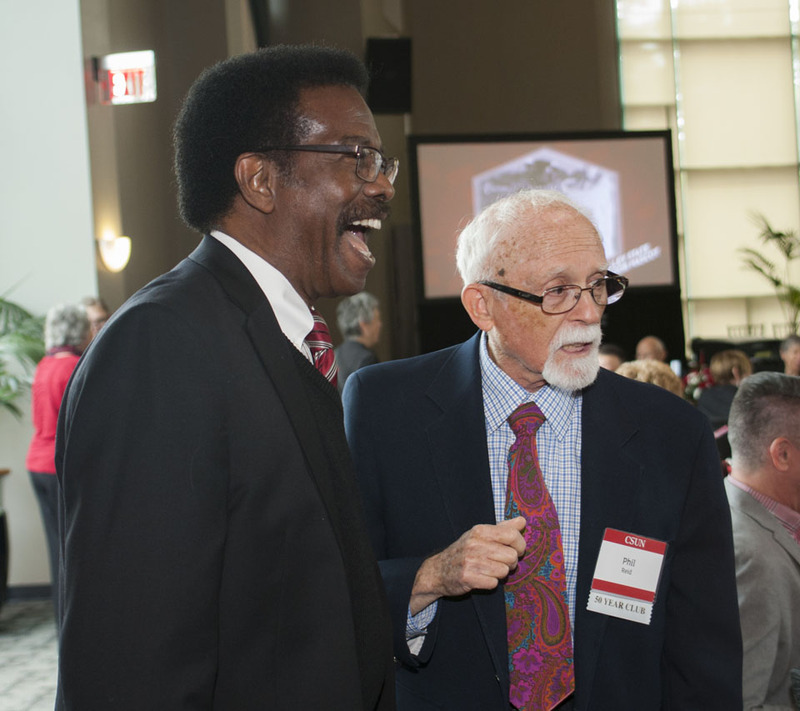 Matador alumnus, Vice President of Student Affairs and Dean of Students William Watkins meets up with alumnus Phil Reed '68 and other Matadors at the annual Founders' Day luncheon, Oct. 13, 2018. Photo by Patricia Carrillo. 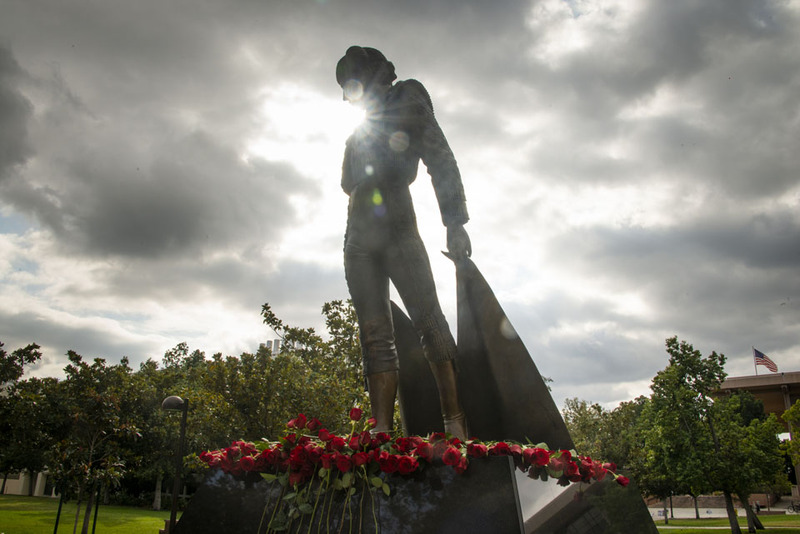 California State University, Northridge's iconic Matador statue stands watch above a bed of red roses, left by alumni who came home to campus for CSUN's 60th anniversary Grand Reunion on Oct. 13, 2018. Photo by David J. Hawkins. 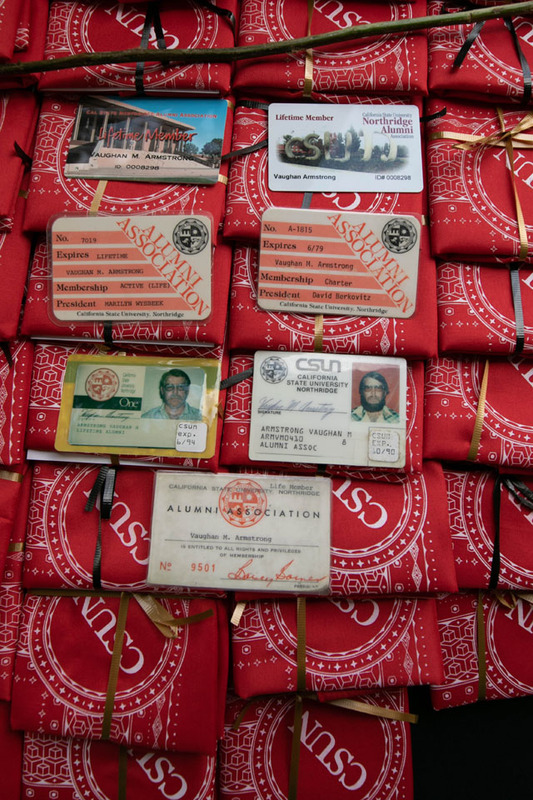 Cindy Chernow ’78 (Anthropology), M.A. 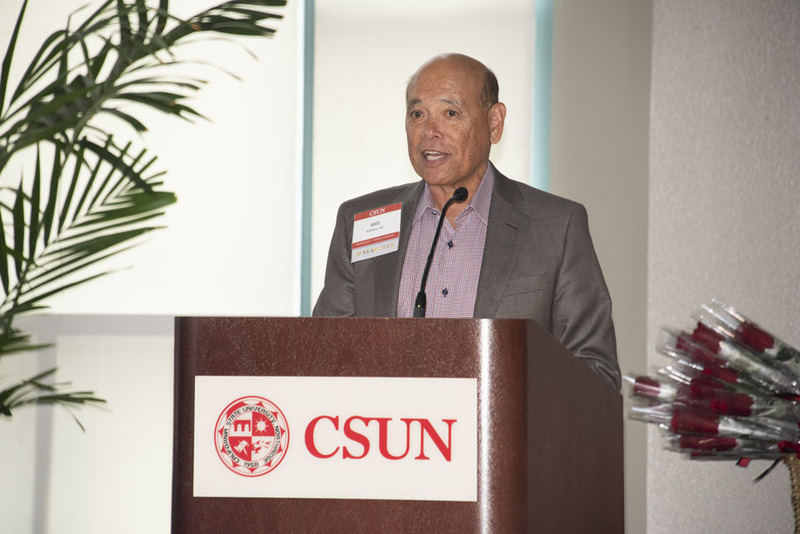 ’91 (Counseling and Guidance) — president of the Alumni Association Board of Directors, speaks at the Founders Luncheon. Photo by Lee Choo. 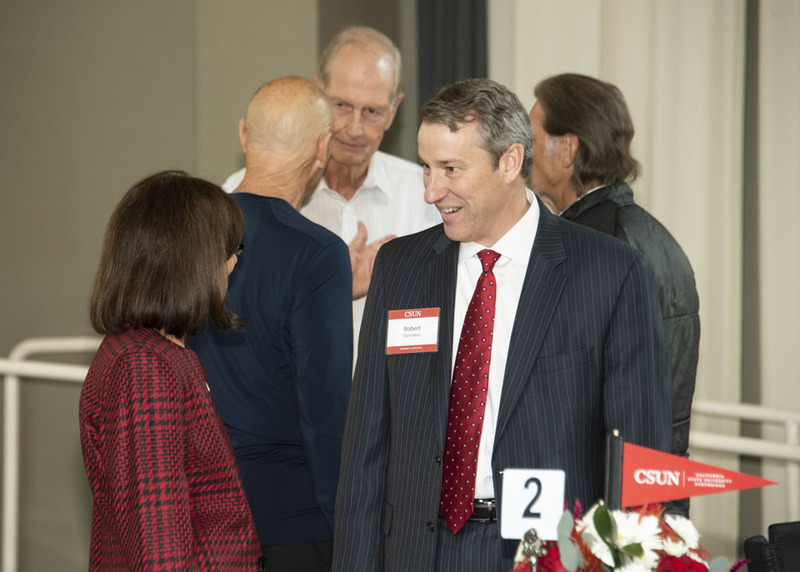 Vice President for University Advancement and President of the CSUN Foundation Rob Gunsalus speaks to Cindy Chernow ’78 (Anthropology), M.A. 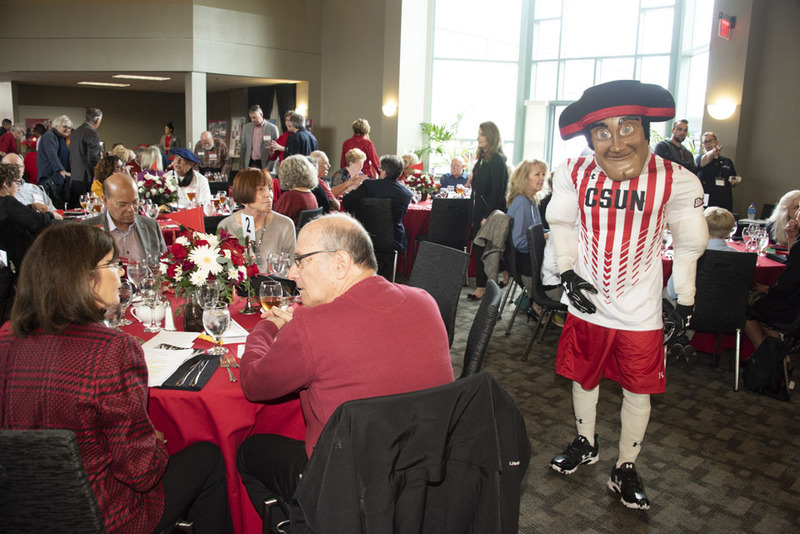 ’91 (Counseling and Guidance) president of the Alumni Association Board of Directors, at the Grand Reunion Founders Luncheon. Photo by Lee Choo. 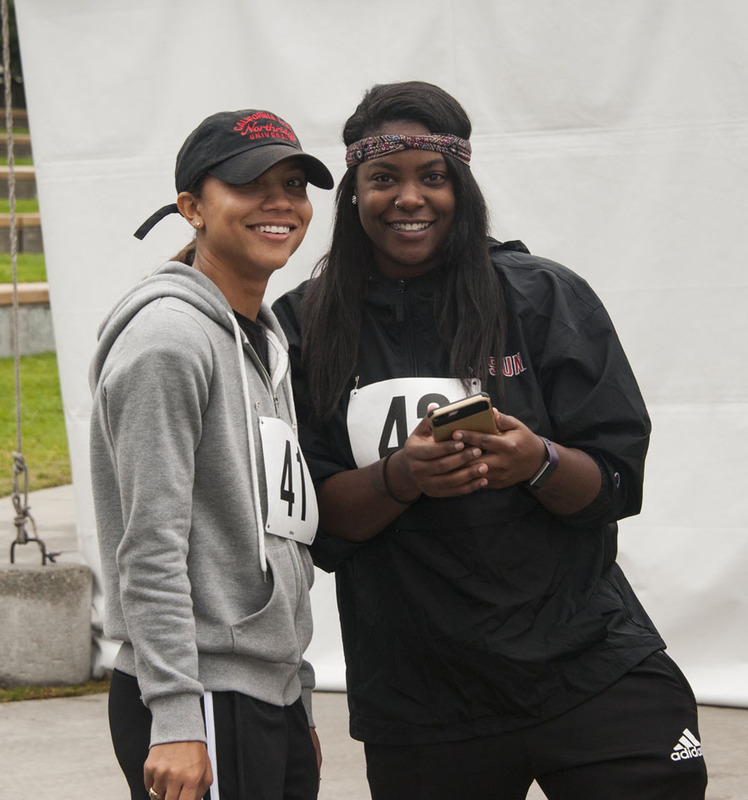 The 5K Matador Fun Run. Photo by Bryan Rodgers. 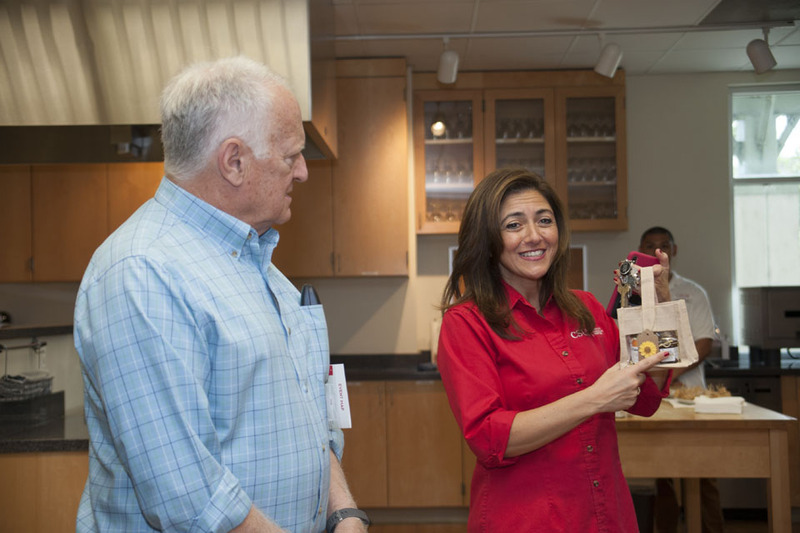 Marilyn Magaram Center executive director and alumna Annette Besnilian leads tours of the center for alumni, on Oct. 13, 2018. 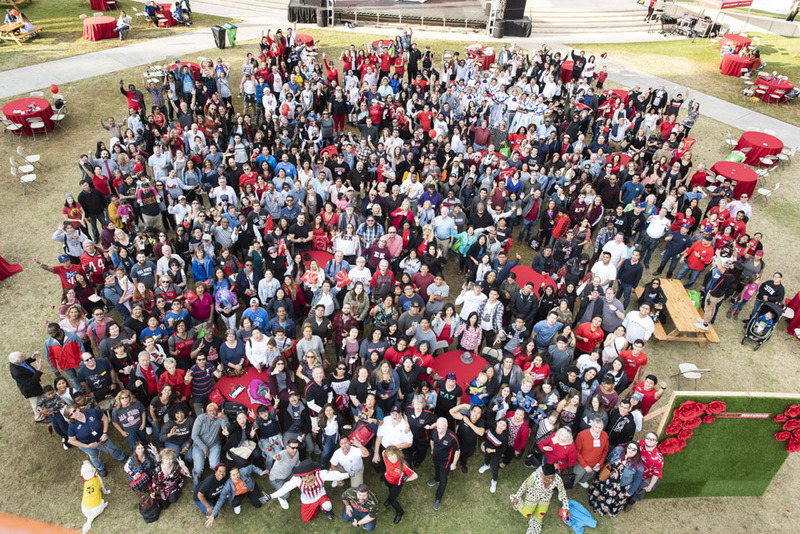 The Grand Reunion event celebrated CSUN's 60th anniversary. Photo by Patricia Carrillo. 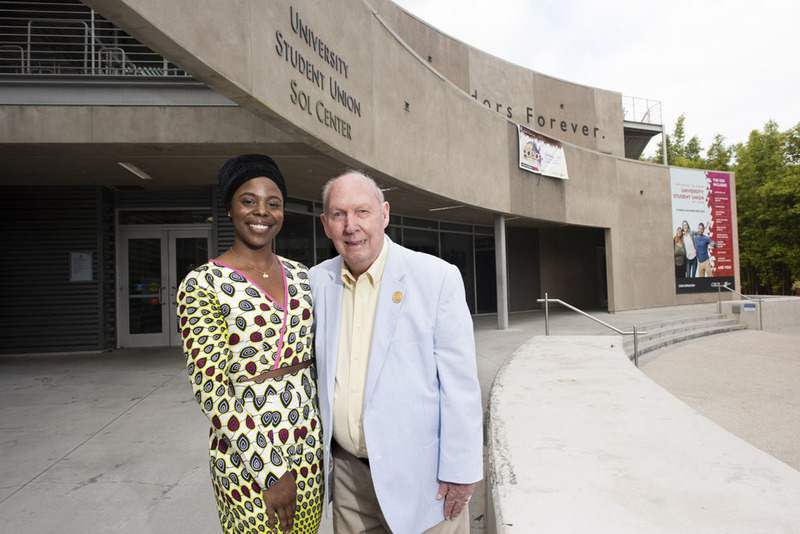 Current Associated Students (AS) President Beverly Ntagu meets and swaps stories with CSUN Distinguished Alumni Award winner and first AS President Frank St. Denis, at the university's 60th anniversary Grand Reunion, Oct. 13, 2018. Photo by Lee Choo. 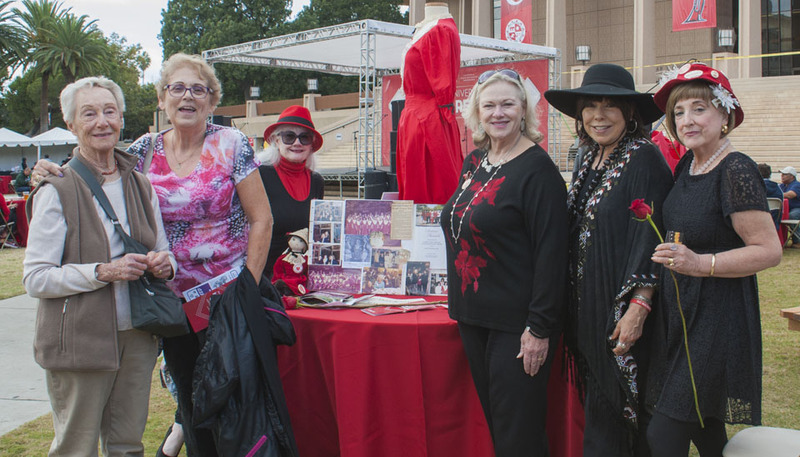 CSUN's "Granny Girls" spirit leaders (from San Fernando Valley State College days) show their Matador spirit in front of the Delmar T. Oviatt Library, on Oct. 13, 2018. 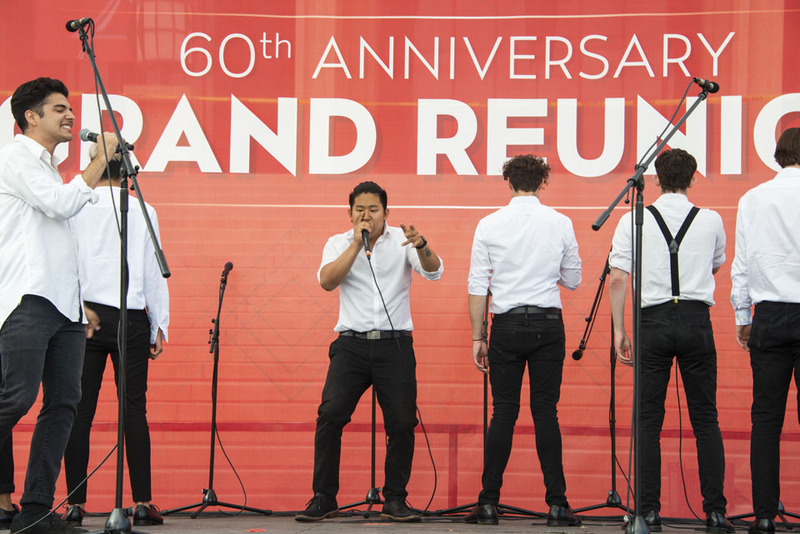 The Grand Reunion event celebrated CSUN's 60th anniversary. Photo by Patricia Carrillo. 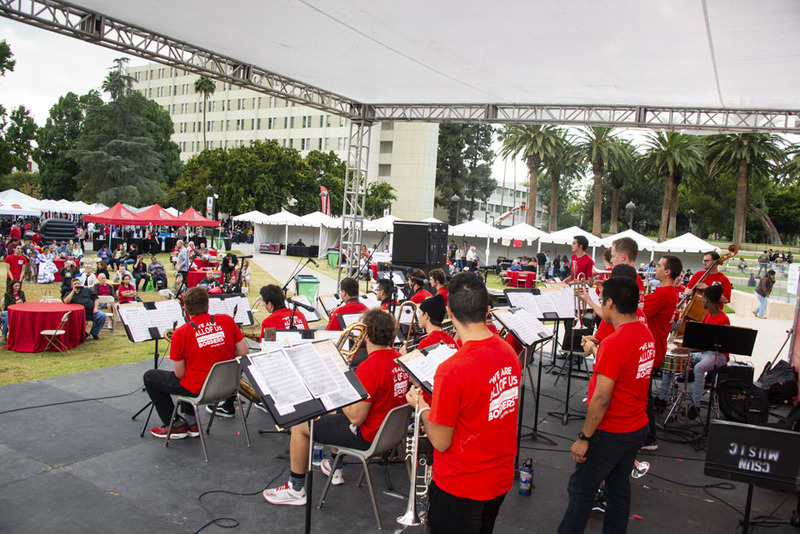 Students in the renowned CSUN Jazz A Band fill the Oviatt Lawn and Quad with jazz and film standards -- including the theme from "Rocky" -- in the "Matadors Got Talent" competition, at CSUN's 60th anniversary Grand Reunion on Saturday, Oct. 13, 2018. Photo by David J. Hawkins. 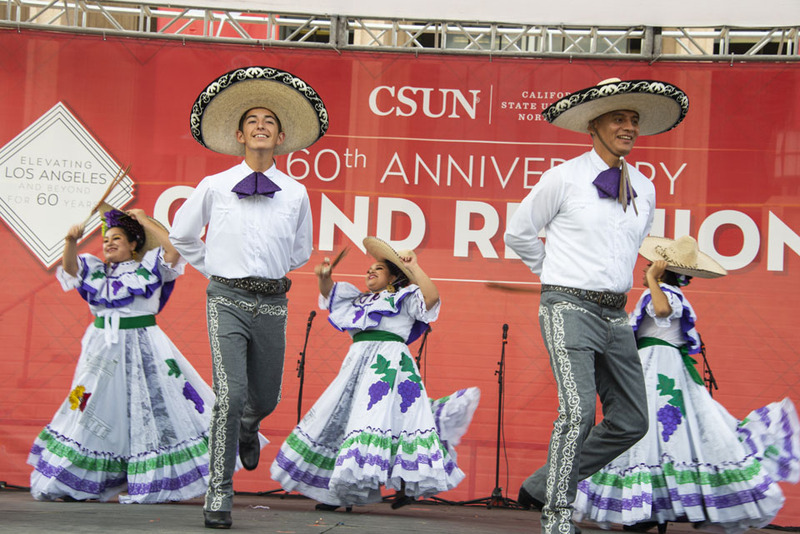 CSUN student group Ballet Folklorico performs in the "Matadors Got Talent" competition, at CSUN's 60th anniversary Grand Reunion on Saturday, Oct. 13, 2018. Photo by David J. Hawkins. 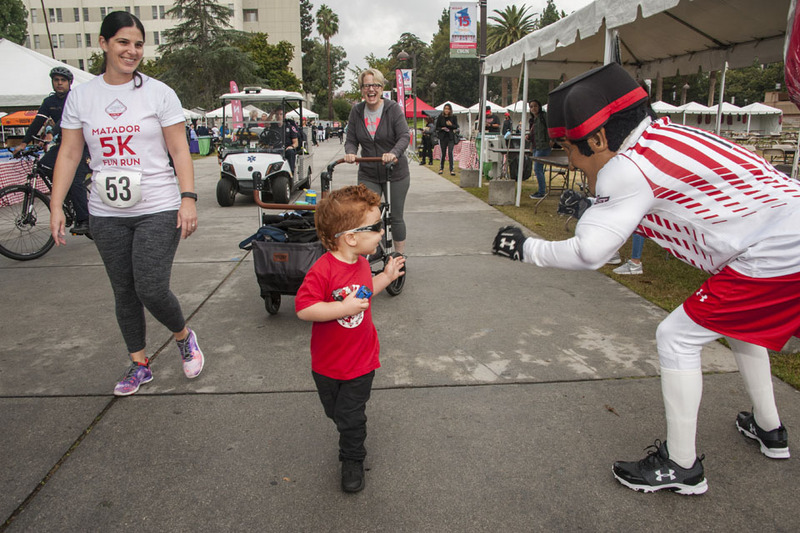 A "junior Matador" high-fives Matty the Matador on Oct. 13, 2018, at the CSUN 60th anniversary Grand Reunion. Photo by Patricia Carrillo. 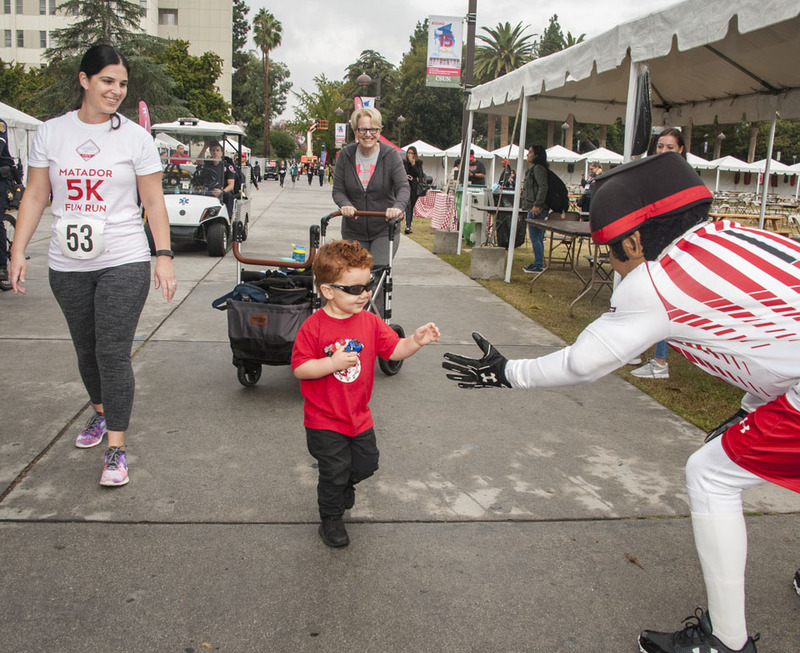 Matador students, alumni, staff, families and members of the community kick off CSUN's 60th anniversary Grand Reunion on Saturday, Oct. 13, 2018, with a "Matador 5K Fun Run." 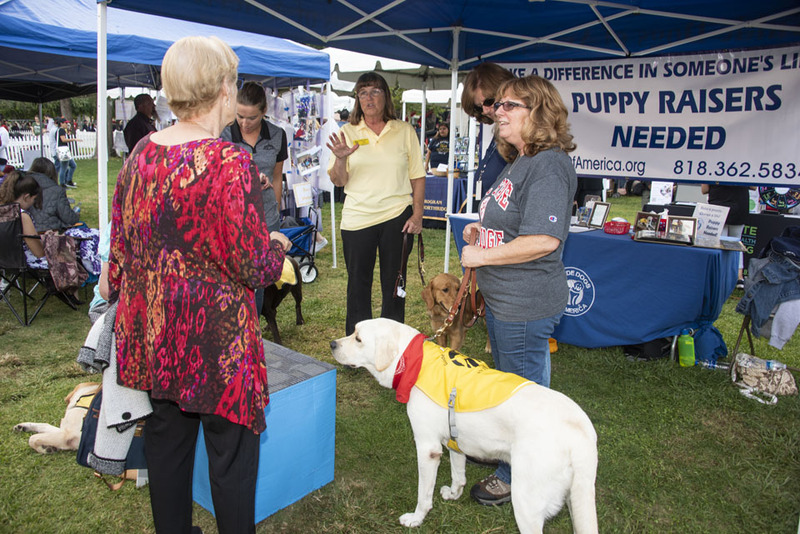 Participants run, walked, strolled and strutted their mutts around the campus perimeter. Photo by Patricia Carrillo. Photo by Patricia Carrillo. 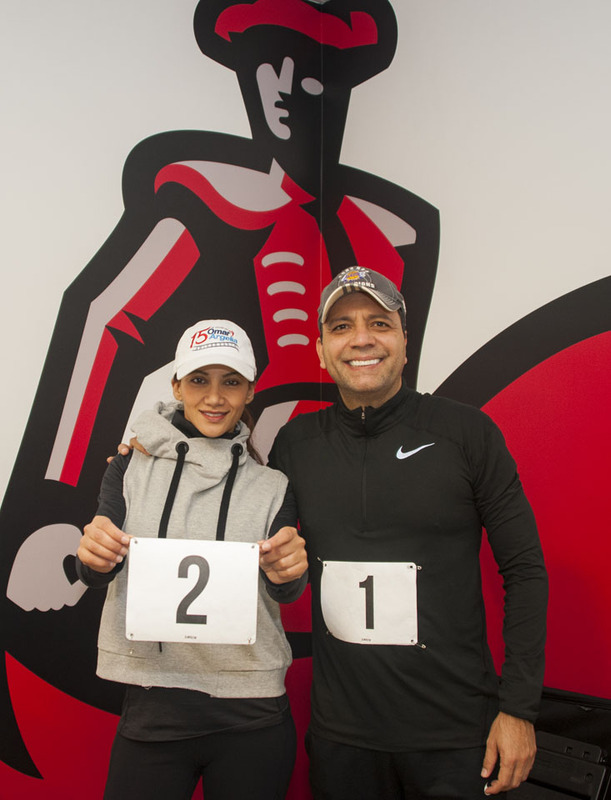 LA radio personalities and CSUN alumnus Omar and Argelia get ready to run the "Matador 5K Fun Run." 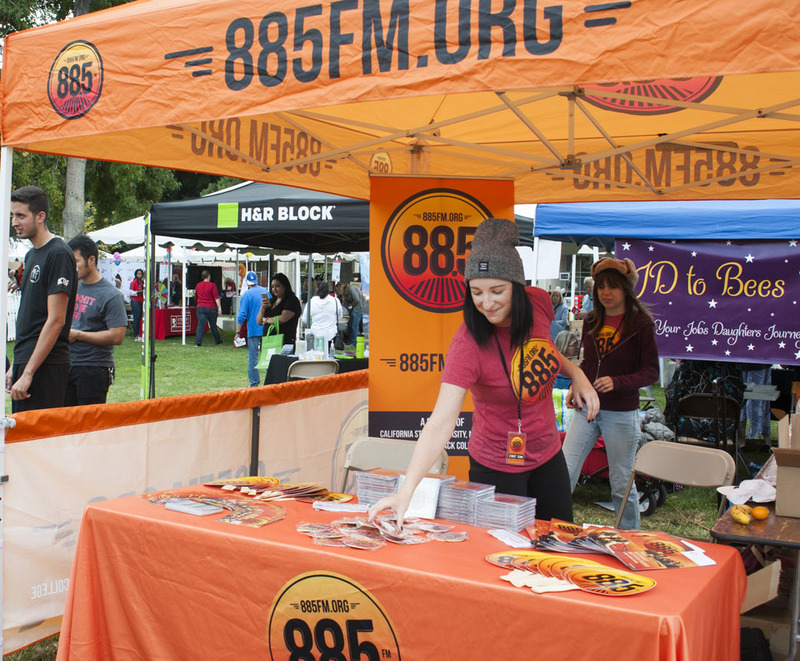 Matador students, alumni, staff, families and members of the community kicked off CSUN's 60th anniversary Grand Reunion on Saturday, Oct. 13, 2018, as they ran, walked, strolled and strutted their mutts around the campus perimeter. Photo by Patricia Carrillo. 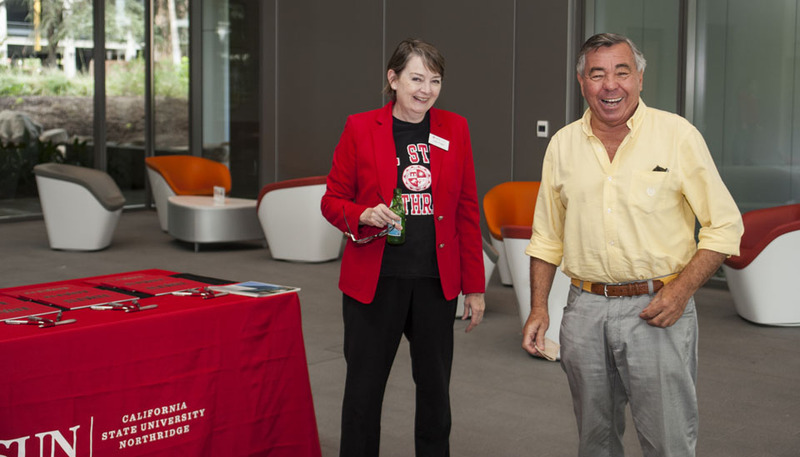 Director of Special University Projects Julia Potter leads tours of CSUN's new LEED-certified Extended University Commons (home of the Tseng College), on Oct. 13, 2018. 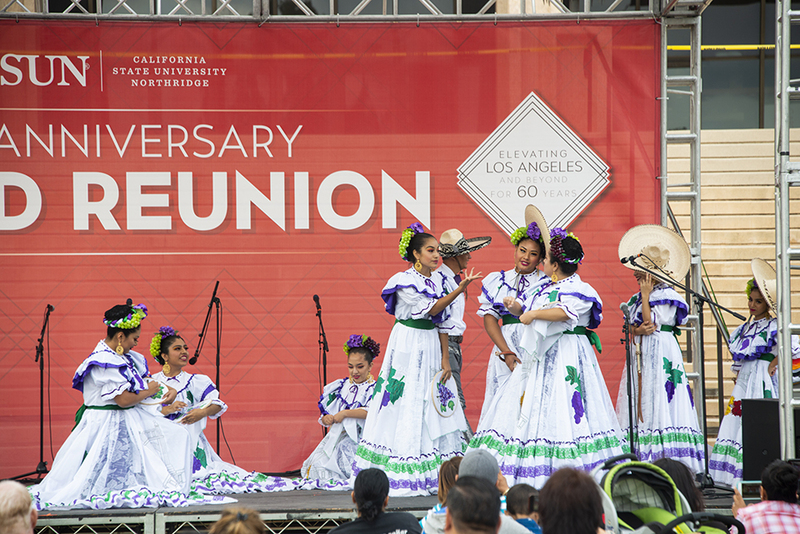 The Grand Reunion event celebrated CSUN's 60th anniversary. Photo by Patricia Carrillo. 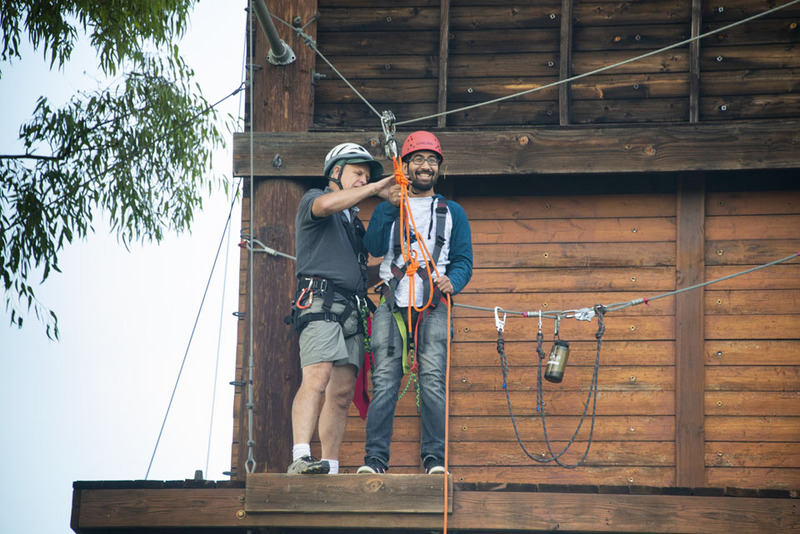 Students and alumni take on the campus zip line, at the CSUN High Ropes Course (adjacent to Matador Field baseball complex), at CSUN's 60th anniversary Grand Reunion on Saturday, Oct. 13, 2018. Photo by David J. Hawkins. Photo by David J. Hawkins. 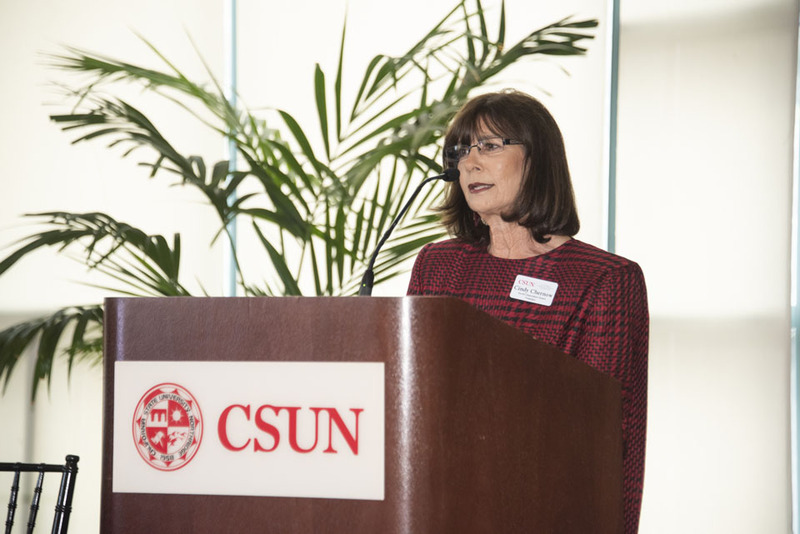 Sherry Sidick, Associate Director of External Relations, gives tours of CSUN's new LEED-certified Extended University Commons (home of the Tseng College), on Oct. 13, 2018. 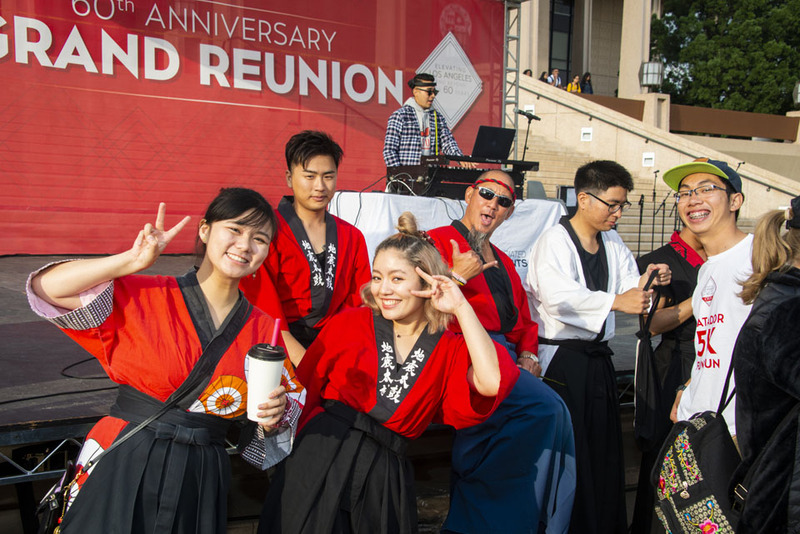 The Grand Reunion event celebrated CSUN's 60th anniversary. Photo by Patricia Carrillo. 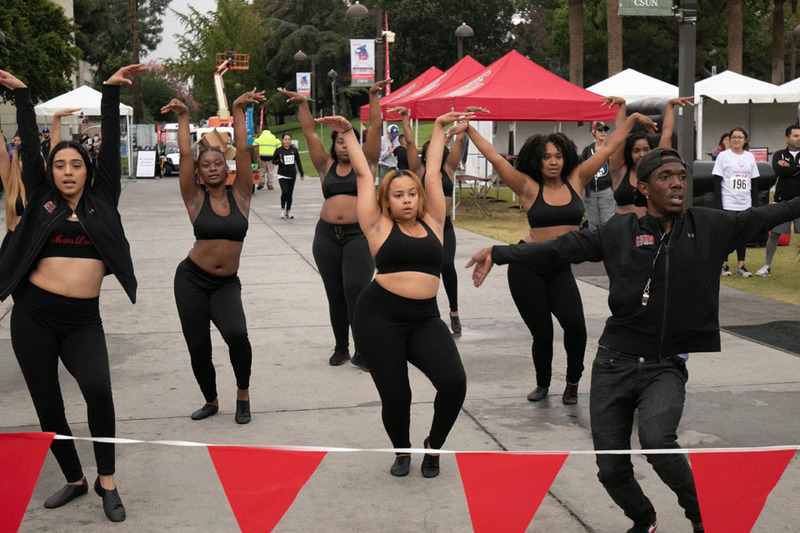 The CSUN hip-hop dance squad the Matadolls help rev up the crowd as Matador students, alumni, staff, families and members of the community kick off CSUN's 60th anniversary Grand Reunion on Saturday, Oct. 13, 2018, with a "Matador 5K Fun Run." 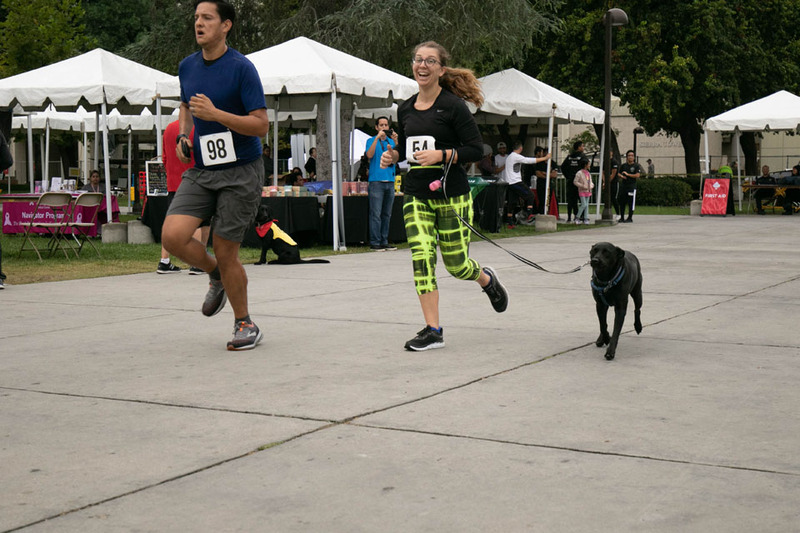 Participants run, walked, strolled and strutted their mutts around the campus perimeter. Photo by Patricia Carrillo. 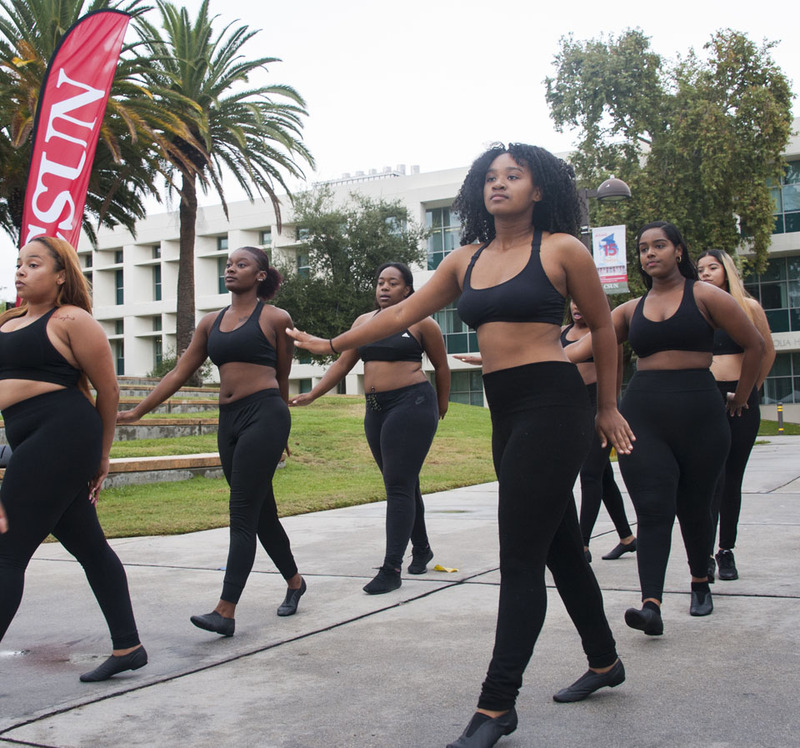 CSUN student group Fasmode performs in the "Matadors Got Talent" competition, at CSUN's 60th anniversary Grand Reunion on Saturday, Oct. 13, 2018. Photo by David J. Hawkins. 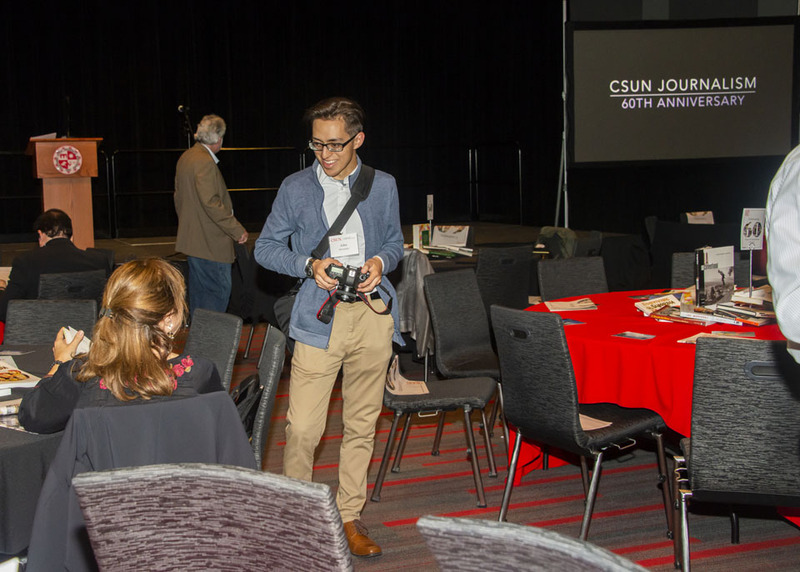 CSUN journalism alumni schmooze a the University Student Union, during CSUN's 60th anniversary Grand Reunion on Saturday, Oct. 13, 2018. Photo by David J. Hawkins. 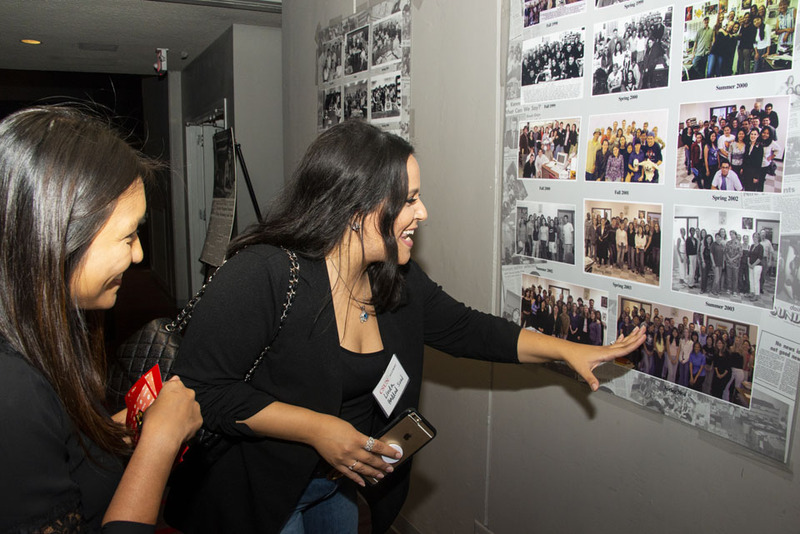 CSUN journalism alumni stroll down memory lane -- browsing Daily Sundial student newspaper staff photos -- at the University Student Union, during CSUN's 60th anniversary Grand Reunion on Saturday, Oct. 13, 2018. 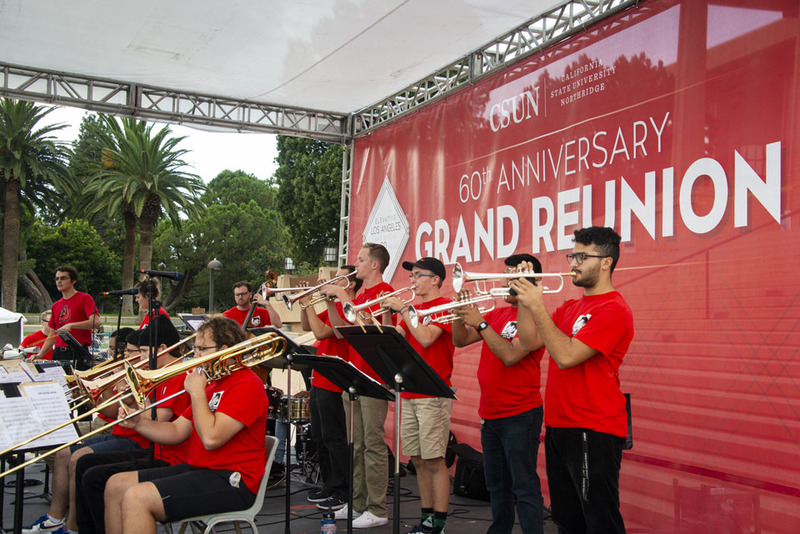 Students in the renowned CSUN Jazz A Band claim the top prize -- a $2,000 cash award -- in the "Matadors Got Talent" competition, at CSUN's 60th anniversary Grand Reunion on Saturday, Oct. 13, 2018. Photo by Lee Choo. 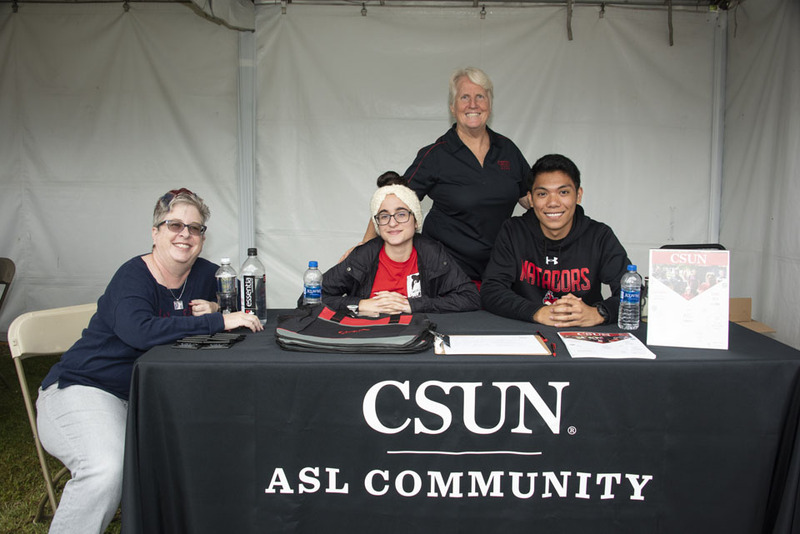 California State University, Northridge alumni show their Matador spirit in front of the Delmar T. Oviatt Library, on Oct. 13, 2018. 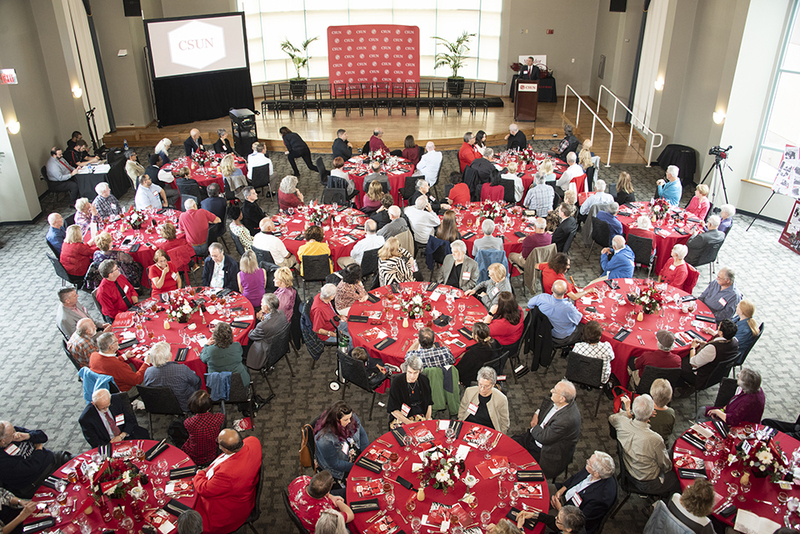 The Grand Reunion event celebrated CSUN's 60th anniversary. Photo by David J. Hawkins. 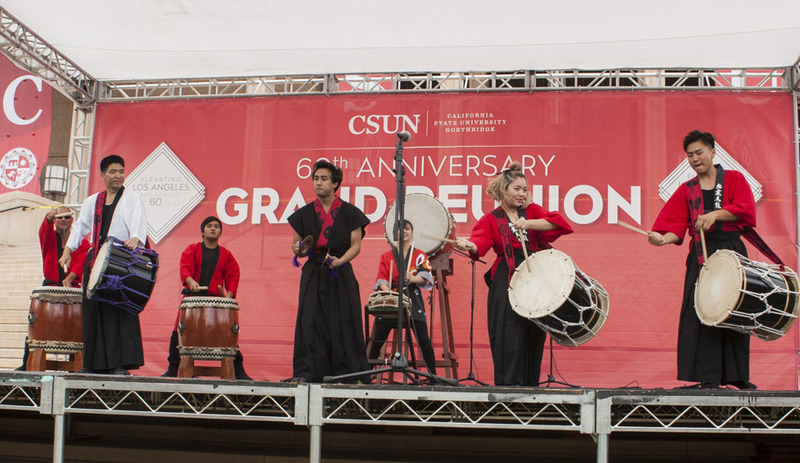 CSUN student members of the campus Taiko drumming troupe strike a pose after their performance in the "Matadors Got Talent" competition, at CSUN's 60th anniversary Grand Reunion on Saturday, Oct. 13, 2018. Photo by David J. Hawkins. 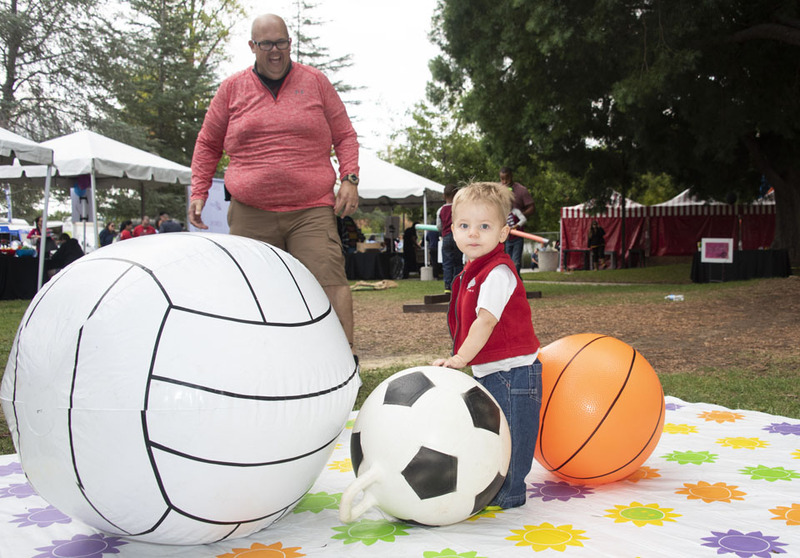 A "junior Matador" plays in the Kids' Zone on Oct. 13, 2018, at the CSUN 60th anniversary Grand Reunion. Photo by Lee Choo. 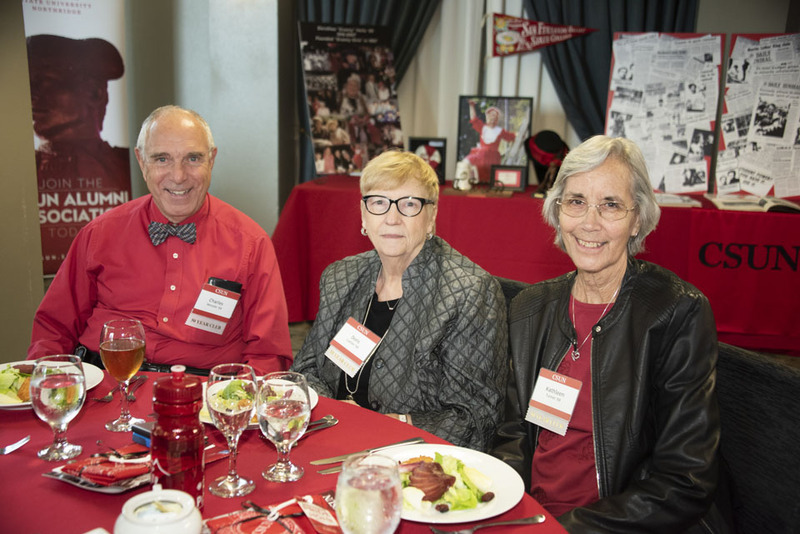 The CSUN Alumni Association inducts members of the Class of 1968 into the 50-Year club, at the annual Founders' Day luncheon, Oct. 13, 2018. Photo by Lee Choo. 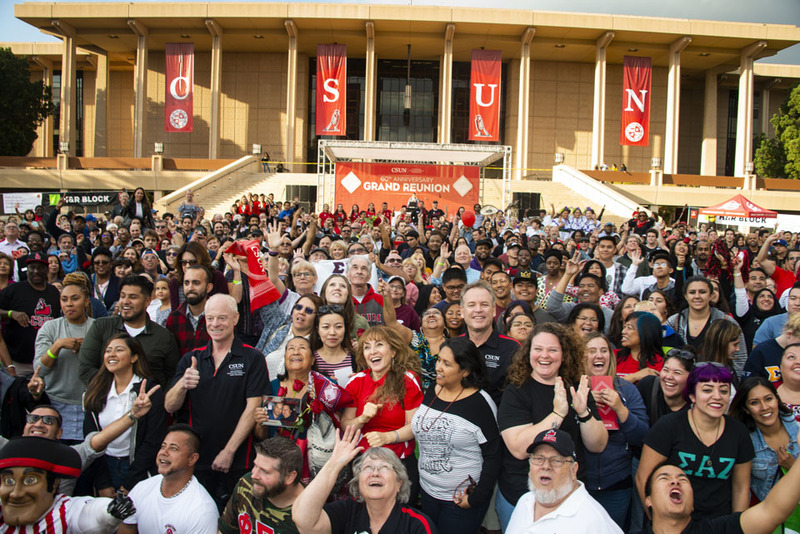 A crowd of thousands of alumni, students, staff, families and members of the community chant, "Once a Matador, Always a Matador!" during a photoshoot in front of the Delmar T. Oviatt Library, on Oct. 13, 2018. 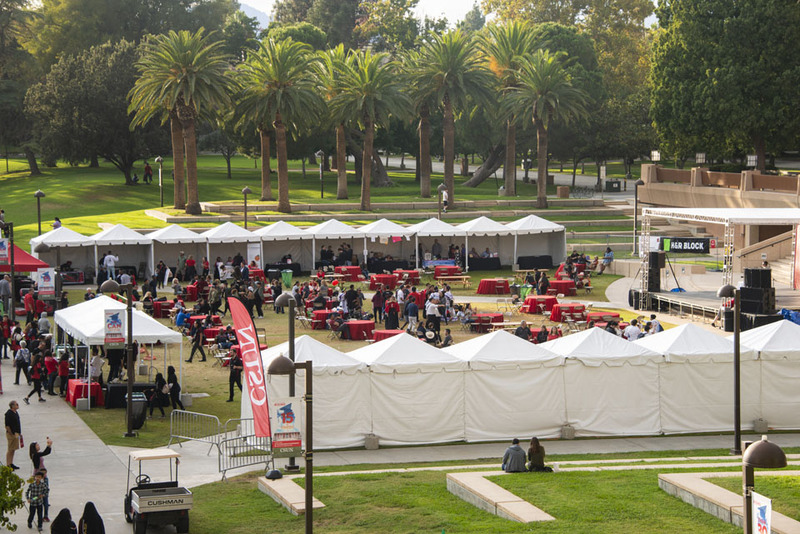 The Grand Reunion event celebrated CSUN's 60th anniversary. Photo by David J. Hawkins. 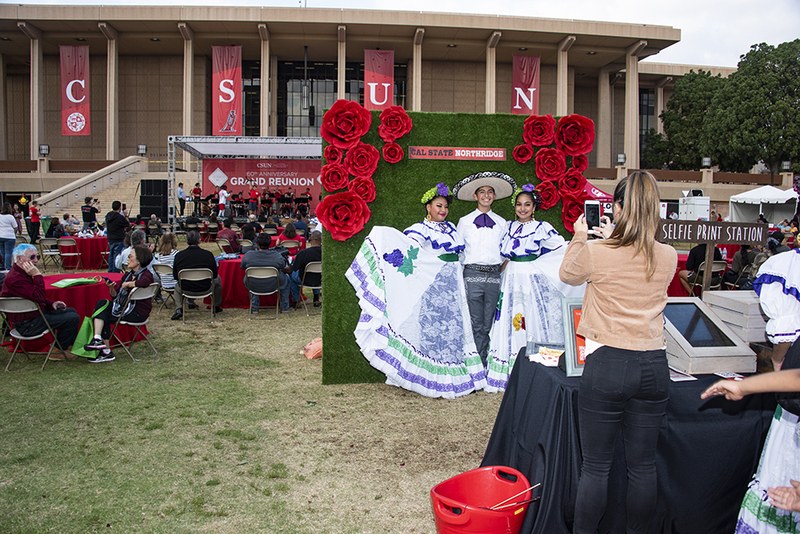 California State University, Northridge went grand on Saturday, Oct. 13, as 6,000 Matadors returned to campus for the university’s 60th Anniversary Grand Reunion. 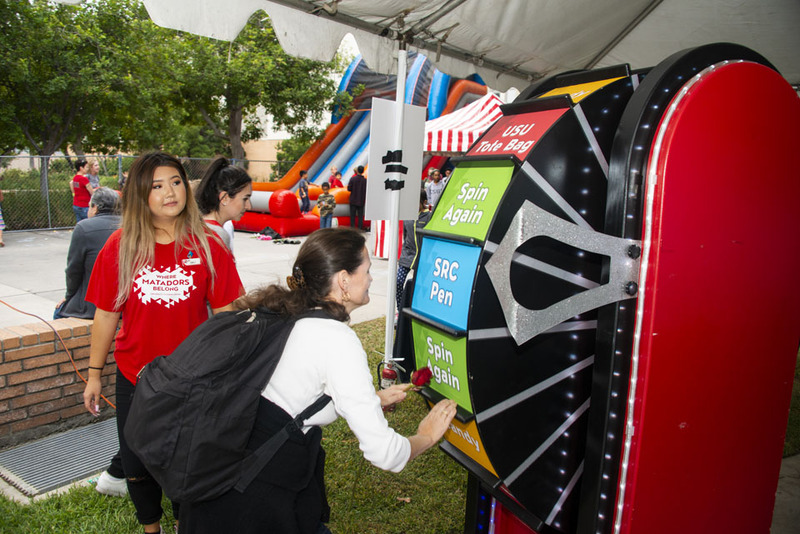 The main event of the day was the Grand Reunion Picnic — an afternoon celebration on the Oviatt Lawn in front of the iconic Delmar T. Oviatt Library where student performers entertained their fellow Matadors on stage and people enjoyed mini-reunions, campus tours, games, food trucks and more. 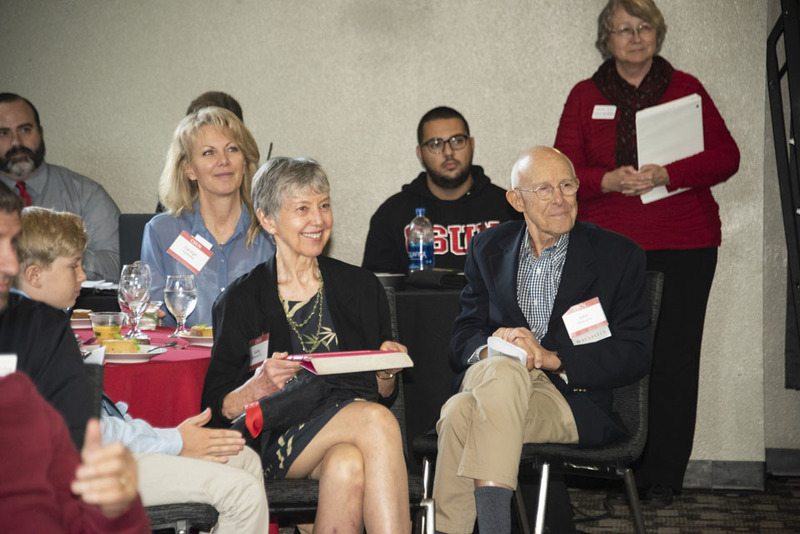 The day started with the Matador Fun Run 5K and led into the invite-only Founders’ Luncheon, where 1968 graduates and faculty and staff who began their service to CSUN were inducted into the university’s 50 Year Club. 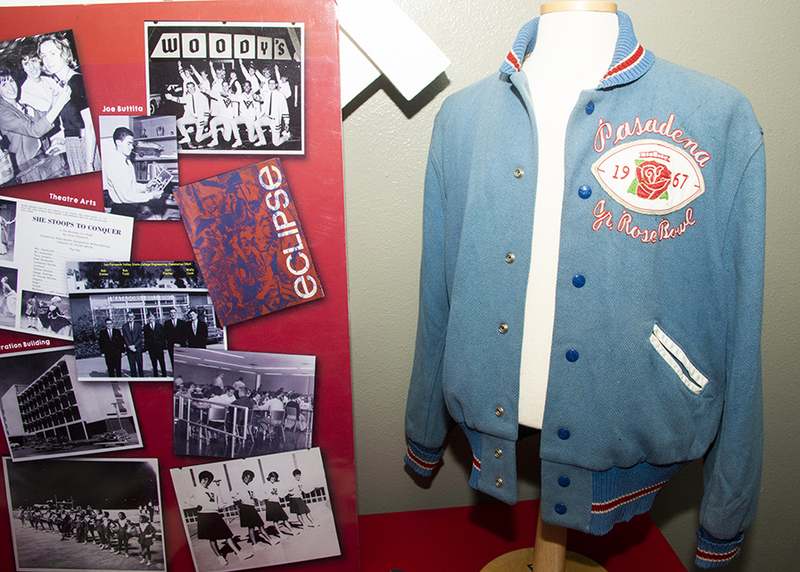 After the Grand Reunion Picnic, some event-goers made their way to watch CSUN Men’s Soccer host Cal Poly, attended reunion gatherings for Journalism, University Student Union or the TAKE stage performance program or watched Moon River and the Music of Henry Mancini (hosted by Monica Mancini) at The Soraya. 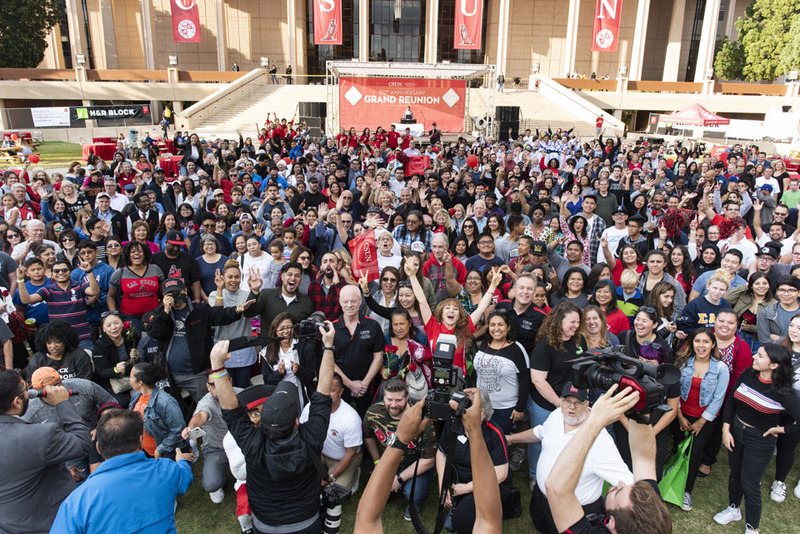 This was CSUN’s largest reunion since the 50th Grand Reunion in 2008. 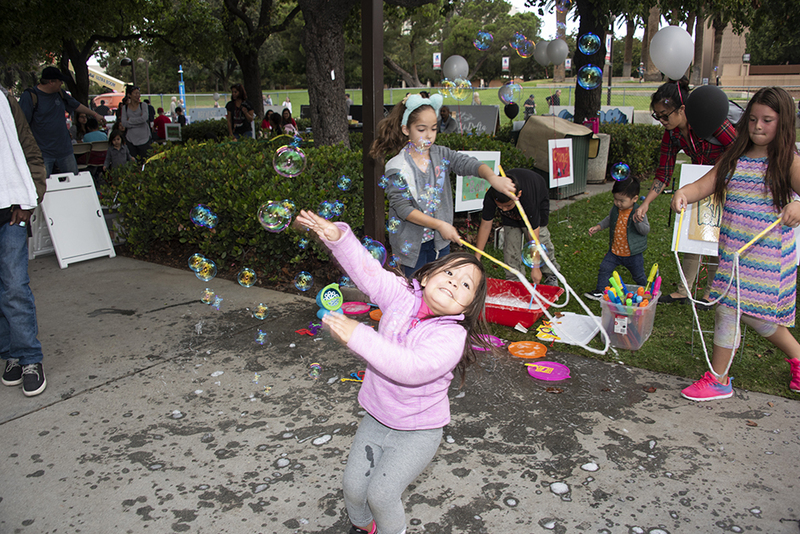 Like at that event, a group photo was taken in front of the Oviatt Library, commemorating a spectacular day for all.